Kinnelon, NJ – The Columbia Business School Alumni Club of NY (CBSAC/NY) held its 2011 elections for officers and directors on June 27, 2011. Christine B. Whittemore, chief simplifier of Simple Marketing Now LLC and member of CBSAC/NY board of directors, has been confirmed co-president of the club and is expected to serve until May 31, 2013. 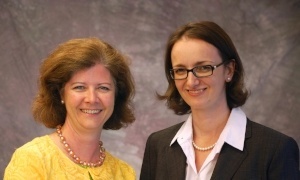 Whittemore ’93 joins Penny Hammond ’02, who was first elected co-president in 2010. CBSAC/NY is an independent not-for-profit 501(c)(3) organization founded by Columbia Business School alumni in 1975. The CBSAC/NY acts as a unique business, networking and educational resource for Columbia Business School graduates, faculty and students in New York and surrounding region, as well as other professionals interested in the educational events offered. “Our mission focuses on strengthening the Columbia Business School alumni network by serving as a positive and valuable resource. We will continue to offer diverse educational and networking events for the over 18,000 Columbia Business School alums in the Tri State Area including over 11,000 in the New York City area, and we also plan to continue to find other ways to help our members and users with professional development and building their networks," says Penny Hammond, co-president of the CBSAC/NY and owner of Chewfo, a market research company focused on food restrictions. The CBSAC/NY club executive committee consists of two co-presidents, a corporate secretary, and a treasurer. Officers and directors of the CBSAC/NY have a fiduciary responsibility to oversee the proper management of the New York alumni club. For more information about the Columbia Business School Alumni Club of New York (CBSAC/NY), please visit http://www.cbsacny.org, follow CBSAC/NY on Twitter, on Facebook and join the LinkedIn CBSAC/NY Group. Simple Marketing Now, a marketing communications consultancy, helps organizations improve the effectiveness of their marketing with social media and content marketing so they can get found by customers For more information, visit http://SimpleMarketingNow.com.